Power bank can charge include: mobile phones, mp3, mp4, mp5, tablets, electronic digital cameras, electronic game consoles. How we use the energy from the banks? Power bank kept away from children. Do not keep portable chargers at high temperature and close to the sources of fire. Banks energy work best at room temperatures. Mobile Phone Charger has no power supply from the mains unit can be charged using a cell phone charger or a computer. For this purpose, use of the cable assembly. Full load bank power after about 8-10 hours. 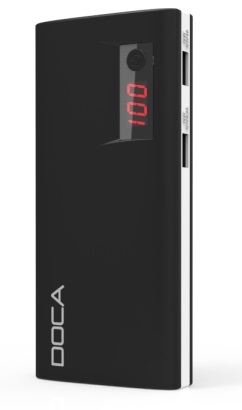 Mobile phone charger is equipped with a display - counter capacity charger. This is a great offer for active people who can not afford to be discharged tablet or phone !! We offer a large power bank to provide access to energy every day, anytime and anywhere !!! What can serve mobile phone chargers? Portable charger can charge the phone. Powerbanki especially suited for charging smartphones. Banks energy you can also charge the tablet (to charge these devices use output USB 2.1 A). Our company offers the best banks cheap energy. Portable charger can also be used for charging electronic cameras. Amateurs and professionals will appreciate the photographs of our best mobile phone chargers. Banks energy can be used to power the navigation, it is recommended especially for people riding bikes. Also amateurs any electronic handheld games will appreciate our Power banks. If you love music, holder of the mp3, mp4 or mp5 also appreciate the advantages of mobile phone chargers. If you wish to learn more or ask welcome to our blog. Electric battery - this device with primary cells (they can be repeatedly charged). If the device can not be recharged many times it has a so-called primary cells.